In our last post, we discussed the methodology used for creating a visually confidential workplace. 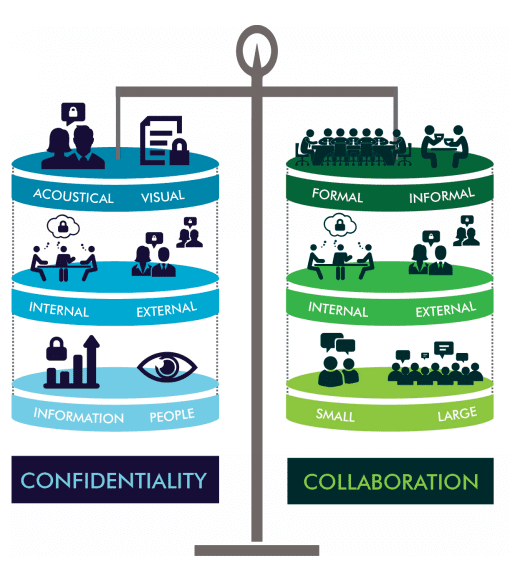 As figure 1 illustrates, however, visual confidentiality makes up only a small portion of overall security. While many of our clients are interested in acoustics because of information security issues, just as many are concerned about employee wellbeing and productivity. A 2001 research paper by organizational psychologists Cooper, Dewe, and O’Driscoll shows that poor noise conditions have a significant impact on the physical health and psychological wellness of workers. Furthermore, a study in 2000, using two test groups (one of which was subjected to realistic, open-office noise), supported earlier findings which definitively show that typical workplace noise levels can have a negative effect on both perceived stress levels and the presence of stress hormones in workers. Suffice it to say, acoustic privacy provides a host of benefits, but for this post our primary concern is information security, not employee wellbeing or unique, non-confidentiality-based operational soundproofing needs (e.g. recording studios, sensory deprivation rooms, testing rooms, etc.). As covered in our previous post, intellectual property becomes increasingly more impactful and valuable every year. A lack of acoustic confidentiality can lead to such potentially devastating consequences as product launch information being leaked to competitors, manufacturing advantages being lost, product designs being stolen, formulas being provided to competitors, etc. While HIPAA regulations don’t require that existing structures retrofit for soundproofing purposes, new buildings are required to ensure that reasonable safeguards are taken to ensure that clients’ sensitive medical data is kept private. Whether for an attorney office, an internal legal department, or simply an area where a legal team might meet, this is one area where soundproofing should not be spared. In this example confidentiality is designed to protect conversations that are delicate, but do not necessarily influence business operations. The Forbes Human Resources Council highlights the need for HR professionals to act with the utmost confidentiality when dealing with harassment complaints. Managers may face similar concerns regarding potentially sensitive conversations with subordinates. Lastly, there are certain spaces in an office where privacy is implied, such as phone rooms, and acoustic confidentiality is more a matter of employee trust than it is a legal requirement. Once the need for confidentiality has been determined, it is best to determine what level of speech privacy is needed. While the need to protect trade secrets may seem like a high priority, the definition of a trade secret may be broad depending on your organization. For example, if your organization uses a formula in its product that gives it a competitive advantage, that information is likely to be limited to highly-qualified, highly-vetted employees, and acoustic privacy will be of the utmost privacy. But if your organization is releasing a new software update and may only gain a slight competitive edge by protecting this information, which is likely to be widely dispersed within your organization, then it will not need to be as highly protected as a formula or manufacturing advantage. In this example, some acoustic confidentiality is still important, but due to the wide diffusion of the information, taking extreme measures towards soundproofing may not be practical. In addition, the value of the information may not warrant the costs associated with soundproofing. The required levels of acoustic confidentiality can help to inform adjacency planning and may even correlate to a specific Sound Transmission Class (STC) or Sound Reduction Index levels (SRI). Developed by ASTM International, STC ratings correlate to a specific decibel level, as well as to a physical sensation. A brief description of other rating scales is provided in figure 2. Adjacency planning is the process of determining where departments or specific offices and spaces should be placed in relation to each other given security, interaction, and access needs. Preliminary action can be taken to make spaces acoustically confidential during the adjacency planning process. This is where your architecture and design team will determine where the most appropriate place for a high-confidentiality area might be. Putting distance between those areas with high levels of confidential activity and those without is the most effective way to block undesired sound transmission. Depending on the privacy needs of your organization, this may also be the time to discuss access control with the end-client to determine what the logistical requirements of the workplace demand (i.e. ensuring that security access levels are in alignment with the suggested adjacency plan). Once areas requiring high speech privacy have been identified, the design and architecture team should further subdivide those spaces in line with their respective confidentiality needs. The placement of walls, doors, ceilings, and partitions should be the next consideration. Intelligently planning where these physical barriers go is one more step to ensuring the simplest level of acoustic confidentiality – that individuals without proper clearance aren’t able to access areas where highly sensitive information is discussed. With physical barriers established, it’s time for the architecture and design team to use what they know about the necessary levels of confidentiality and determine what soundproofing/sound blocking materials are most appropriate for the space. Generally speaking, sound blocking materials are more inconvenient to install as the project matures and, therefore, should be determined first and placed in less movable/flexible areas. During this stage, the team will determine important details like wall thickness, insulation, the implementation of soundproof glass partitions, and the necessary STC ratings of commercial grade doors, windows, etc. As sound absorption materials are inherently less permanent, these are determined near the end of the process. Whereas sound blocking inhibits the transmission of sound from one area to another, sound absorption absorbs echo. While the use of sound absorbing materials in the workplace is mostly for reasons of employee comfort and productivity, these techniques do contribute to speech privacy and can be a vital part of designing some of the most sensitive areas. Sound absorption options are more prevalent in open or semi-open office environments than than those discussed in earlier stages of the Acoustic Confidentiality Planning Process and can be seen in acoustic clouds, panels, baffles, and furniture. 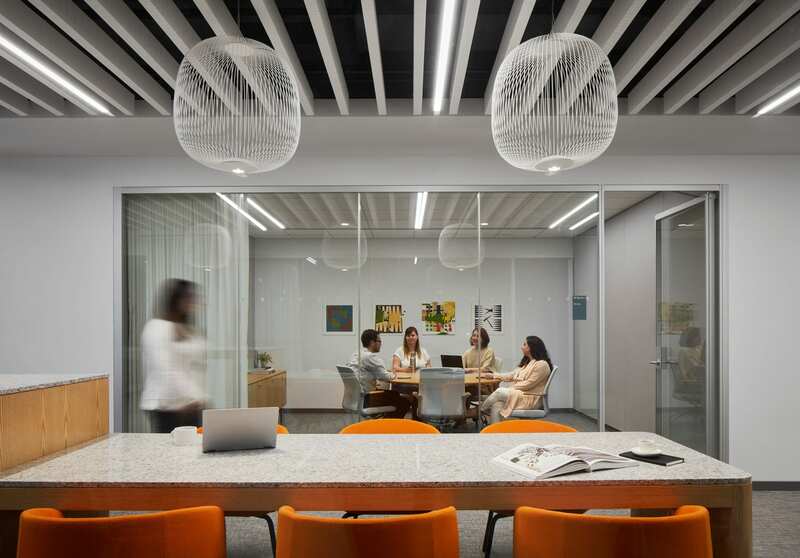 The above space, designed for a confidential client in Chicago by IA Interior Architects, features acoustic ceiling baffling as well as acoustic sound-rated glass walls to provide maximum comfort, as well as confidentiality. A result of recent studies by organizational psychologists, sound masking is the process of increasing privacy by using unobtrusive sounds to disguise speech, thereby improving confidentiality. Generally the result of an electronic sound management system, sound masking is markedly different from other forms of sound management because it introduces more sound into the environment rather than removing or blocking it. Similar to STC, this is the primary rating system used outside of the United States to measure the sound reduction properties of a given material. ​Specifically designed to measure sound absorption, this rating system specifically measures the amount of sound buildup in a space, and is therefore less relevant to privacy concerns than SRI or STC. Typically relied upon for building floors and other impact bearing structures, this rating system measures how well a surface attenuates sounds that are the result of a direct impact, often measured using a tapping machine. Once this process has been completed additional steps, such as ensuring proper installation, will be required to reach the end goal of appropriate, unobtrusive acoustic confidentiality. We highly recommend that the interior architecture team, as well as select vendors, be brought onsite to make sure that key elements (which can vary greatly in complexity) are installed correctly. Ultimately the art of designing for acoustic confidentiality is still an inexact science, although ever-improving rating systems and recent advances in the field of soundproofing point to a future in which speech privacy can be all but guaranteed by a knowledgeable design and architecture team. In our work with Sonos, our understanding of acoustics was of vital importance. View the case study to see project images, data, and other insights. They may not be a life or death matter, but acoustic confidentiality can be a matter of national security.